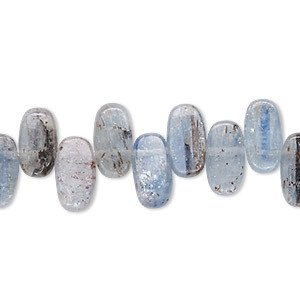 Bead, blue kyanite (natural), 11x5mm-12x6mm top-drilled flat oval, B+ grade, Mohs hardness 4 to 7-1/2. Sold per 8-inch strand. Item Number: H20-9577GS Have a question about this item? Fantastic blue-green translucent hues with an inner metallic shimmer, kyanite flat oval beads have a refreshingly cool quality. 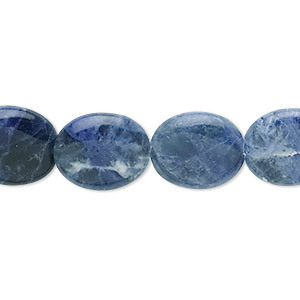 Natural blue kyanite has varying color patterns, which add to the individual beauty of each bead. 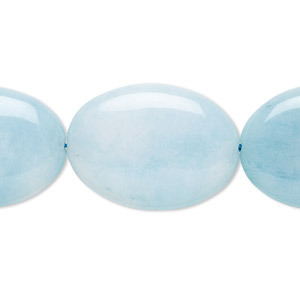 Bead, blue chalcedony (natural), 20x15mm flat oval, C grade, Mohs hardness 7. Sold per 8-inch strand. 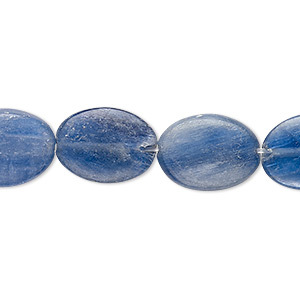 Bead, blue kyanite (natural), 11x7mm-13x9mm flat oval, C+ grade, Mohs hardness 4 to 7-1/2. Sold per 15-inch strand. 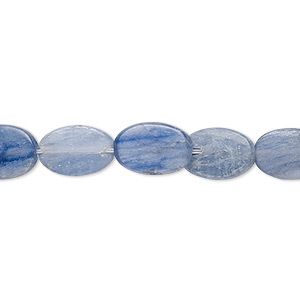 Bead, blue kyanite (natural), 15x11mm-16x12mm flat oval, C+ grade, Mohs hardness 4 to 7-1/2. Sold per 15" to 16" strand. 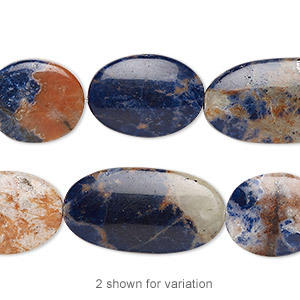 Bead, orange sodalite (natural), 15x13mm-26x14mm hand-cut flat oval with 0.5-1.5mm hole, B grade, Mohs hardness 5 to 6. Sold per 8-inch strand, approximately 10 beads. 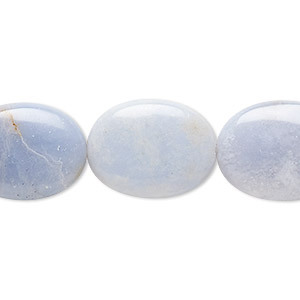 Bead, sodalite (natural), 14x12mm flat oval, B grade, Mohs hardness 5 to 6. Sold per 15-1/2" to 16" strand. 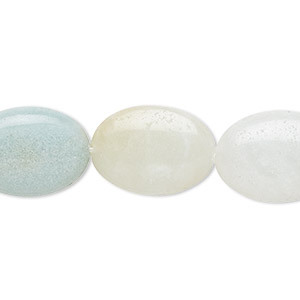 Bead, amazonite (natural), light to dark, 18x13mm flat oval, B grade, Mohs hardness 6 to 6-1/2. Sold per 15-1/2" to 16" strand. 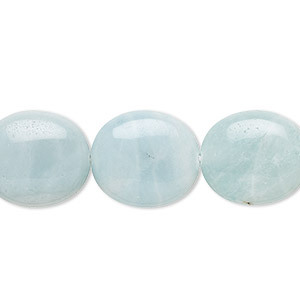 Bead, amazonite (natural), 14x12mm flat oval, B grade, Mohs hardness 6 to 6-1/2. Sold per 15-1/2" to 16" strand. 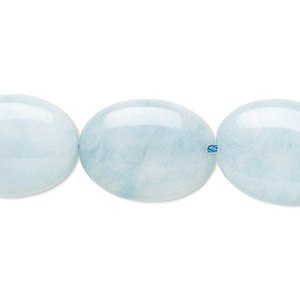 Bead, "larimar" (quartz) (dyed), aqua blue, 20x15mm flat oval with 0.5-1.5mm hole, B grade, Mohs hardness 7. Sold per 8-inch strand, approximately 10 beads. Bead, "larimar" (quartz) (dyed), aqua blue, 25x18mm flat oval with 0.5-1.5mm hole, B grade, Mohs hardness 7. Sold per 8-inch strand, approximately 8 beads. 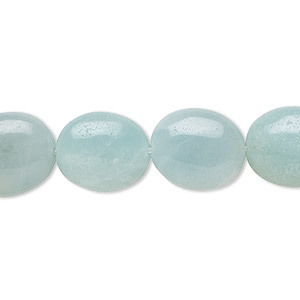 Bead, amazonite (natural), 16x14mm flat oval, B grade, Mohs hardness 6 to 6-1/2. Sold per 15-1/2" to 16" strand.